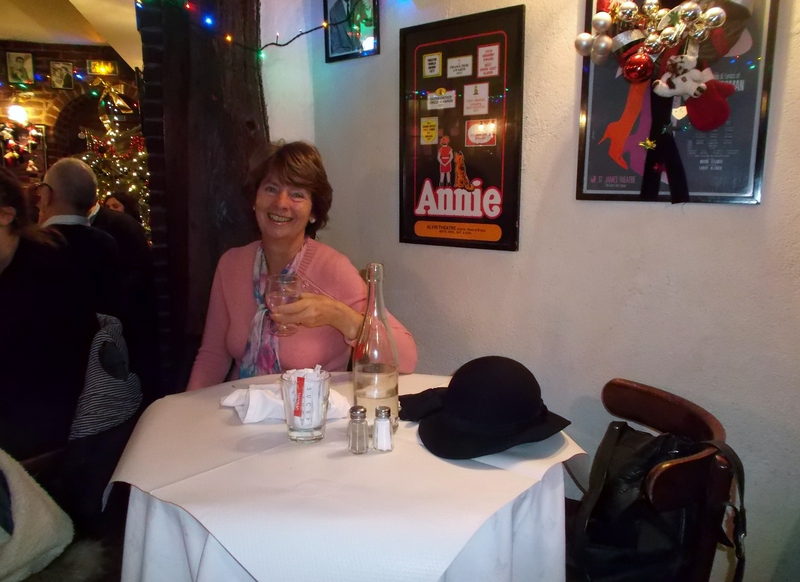 A Canadian Canary Visits Paris: Food, Fabulous French Food! 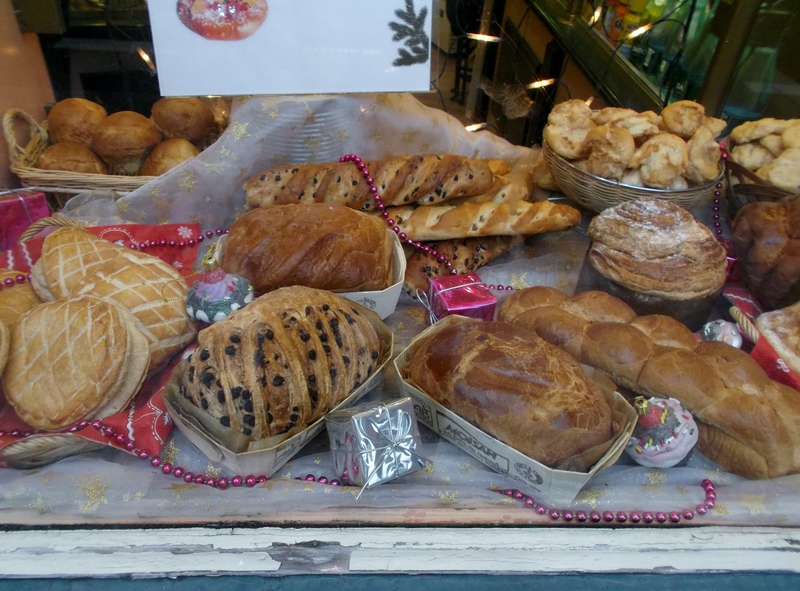 Bread (le pain – pronounced ‘pan’) is a ubiquitous staple of countless variations in France! Here is a little visual sample to make your mouth water! experiences in Paris took me almost completely off of my established tropical régime (diet) of bountiful fruits and vegetables in Dominica. But that was part of the plan and I was well prepared to sample some different flavours and textures, without any regret! Because of my environmental health challenges, I tend to avoid common processed and/or refined foods (bread, milk, sugar) that can give me allergy-related problems. 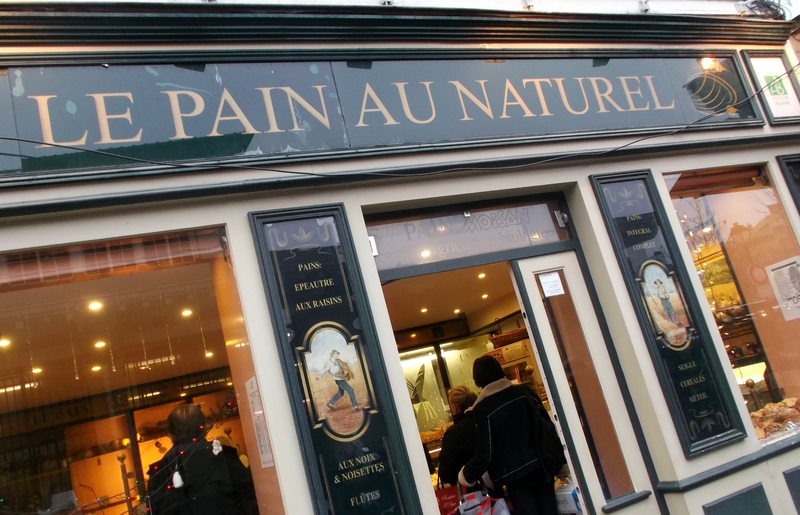 However, it was impossible NOT to eat ‘French’ bread: the scent, the texture, the taste and its appearance at EVERY meal broke me down at least once a day. YOLO (you only live once! ), as some of my friends would remind me. 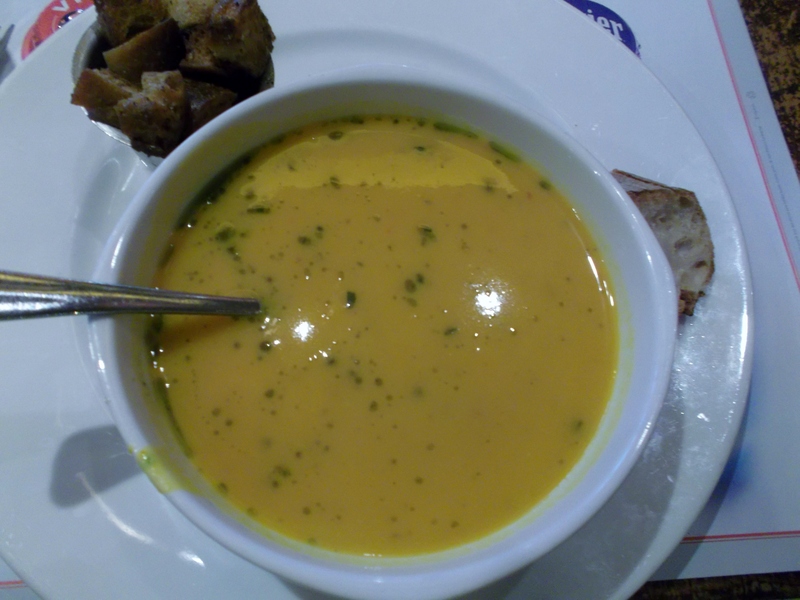 This rich pumpkin soup sustained me for the better part of a day! As I am not much of a meat eater, I fared well with hearty soups: a pumpkin variety and popular zucchini were rich, energizing and filling as a midday meal. I’d never had zucchini soup until Paris. I did benefit from its popularity while I was there! 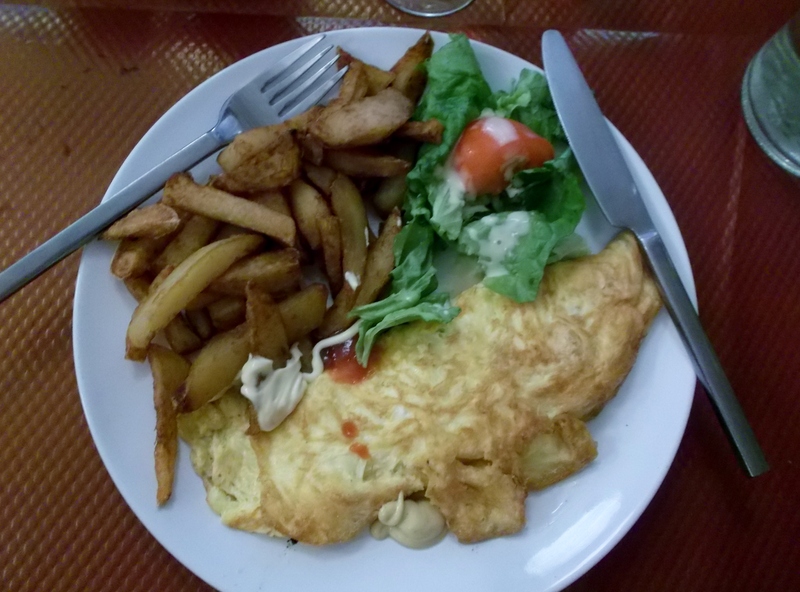 French omelettes suited me very well; with home fired potatoes and salad, I was satiated for many hours! occasionally chicken or fish dishes and mild goat cheese (chevre). I did break down one Sunday afternoon between outings to have a big traditional dinner: delicately seasoned pork charcutiere, mashed potatoes and green salad. It reminded me of one of my late mother’s special concoctions, so of course, it was divine! As it was still the yuletide season, I appreciated sweet Clementine oranges from Spain and Corsica, which brought back childhood memories of discovering this tasty foreign fruit in my stocking on Christmas morn. Bins at every grocer and market were spilling over with this Vitamin C rich fruit and I purchased them frequently at very reasonable prices. I also gorged on apples; while not likely organic, I peeled off the skin and ate them with the chevre and oat cakes for a light supper snack. Speaking of which, I was able to find organic oatmeal and local honey, which I cooked into a hot, sweet porridge to start my day when I stayed in a lovely AirBNB apartment in Montmartre. (Details to follow in a subsequent post). 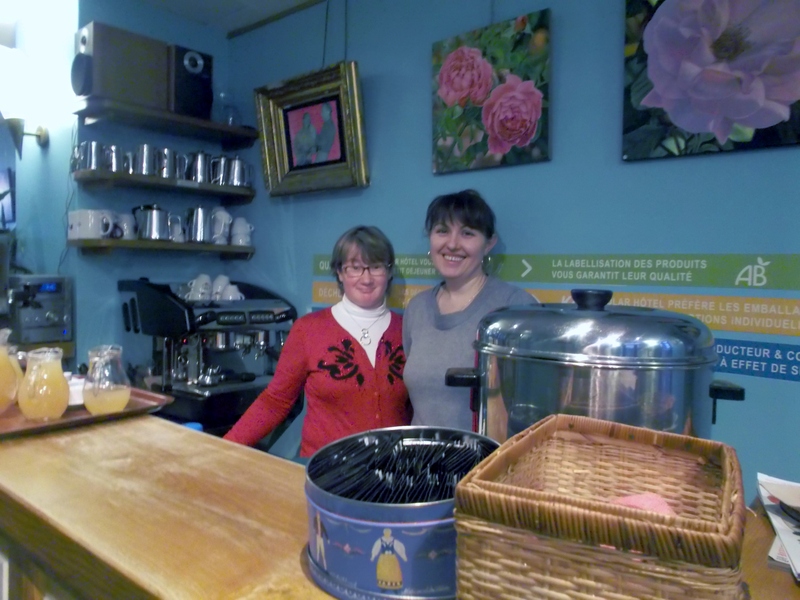 The cheery staff at the Solar Hotel served me an organic café au lait every day! The bright dining room at the Solar Hotel was set for breakfast: the organic apple juice was already on the tables! every day as part of its ecological philosophy. There, I was able to enjoy French foods that had not been treated with pesticides: cider-like apple juice and compote; jams; yoghurt; croissants and breads; hearty granola;milk; tea;coffee; hot chocolate; sugar; and honey. While there may have been other organic offerings around the city which escaped my notice or knowledge, I did happen upon a pizzeria in Montmartre( Pizza Pink Flamingo), which offered this Italian delight with an organic crust, and other chemical-free toppings, when available. It was located only a few steep steps from the famous Sacre Coeur cathedral, and did very well from the tourist business! While it was winter, fresh vegetables were scarce, but I was able to eat mesclun (green salad mix) every day. If by chance they were grown in greenhouses, then I would hope that they were organic! Okay, I admit that I did not suppress my sweet tooth: that would have been a distasteful thing to do in Paris! I didn’t overdo it but I did succumb to the sugary flavours in a few delectable desserts: the carrot cake at the Joe Allen Restaurant and Bar was hearty, nutty, spicy, creamy, and rich: a meal in itself! 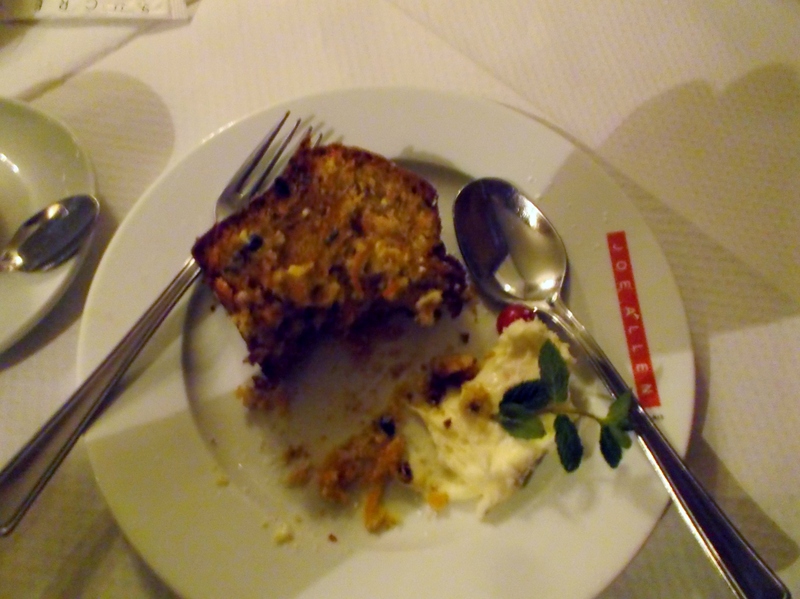 The Carrot Cake at the Joe Allen Restaurant almost disappeared from my plate before I remembered to take a photo of it! I tried it at my second visit to this popular American eatery. Isn’t this incredible? 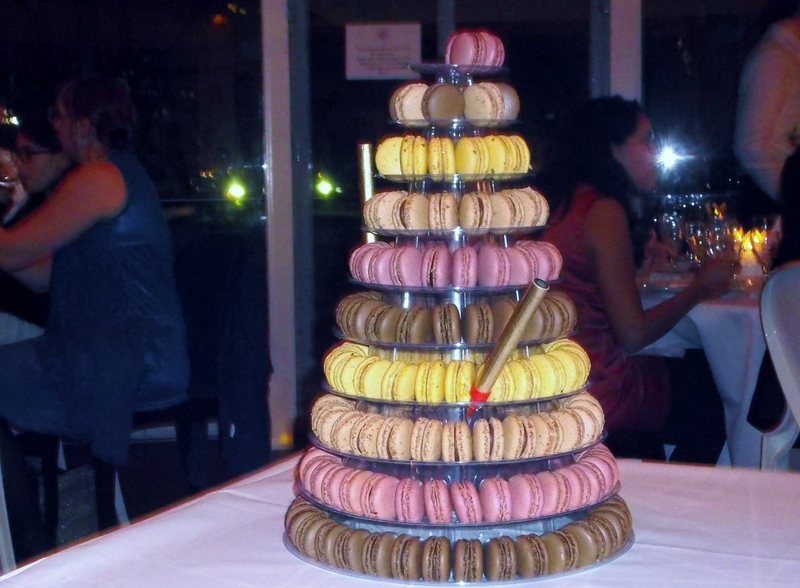 This is a traditional French wedding cake – made from macaroons, which was served and Carole and Gildas’s wedding! More on that event later. Macaroons, for which France is famous were too sweet for me, that is, after I had eaten two! Little patisseries (pastries) with coffee perked me up with a café au lait on the side for a mid-morning break. Generally, I avoided bakeries as there were always other temptations everywhere I turned. Chocolat chaud, thick and creamy with a biscuit and a bitter chocolate square on the side proved to be the perfect mid-afternoon energizer. 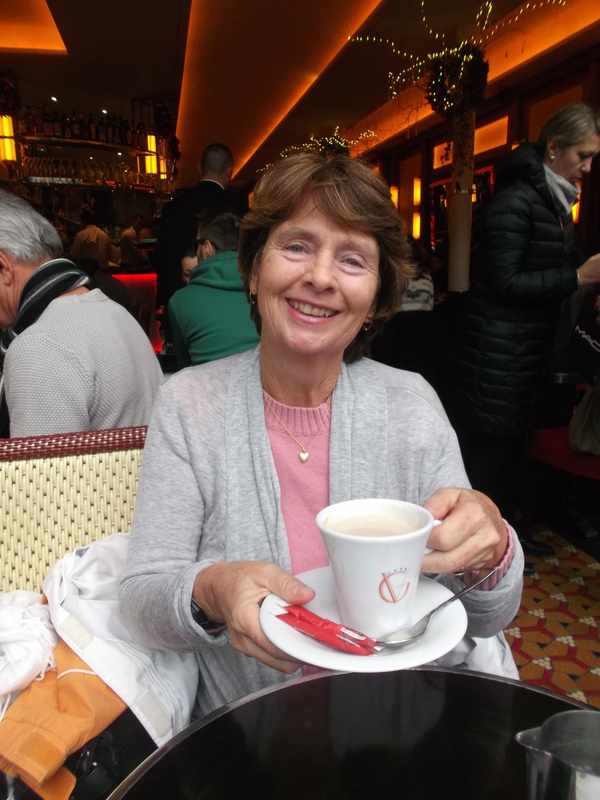 Hot chocolate was the perfect afternoon pick-me-up during my fun-filled days in Paris. After a delicious chicken caesar salad at the Joe Allen Restaurant and Bar, I refreshed myself with a few glasses of water from that carafe. I also drank lots of tap water, as it did not taste as if it were heavily chlorinated. I also caught on to the French habit of asking for a carafe de l’eau (carafe or glass of water) with every meal or even just a coffee. That way, I stayed hydrated, despite the winter cold. And as for those extra calories, well, I might now understand why most French people stay slim! It may be the wine (I only had a few sips of alcohol at the wedding), but it must also be the hundreds of steps or stairs that one encounters everywhere(Métro (subway) access, buildings with no elevators, hilly Montmartre, parks on different levels, basement toilets in restaurants etc.) or the quick movements necessary to cross wide boulevards before the light changes or the collective inclination to walk fast (and keep warm)! I even picked up my pace and was glad of my prior physical conditioning in Dominica. 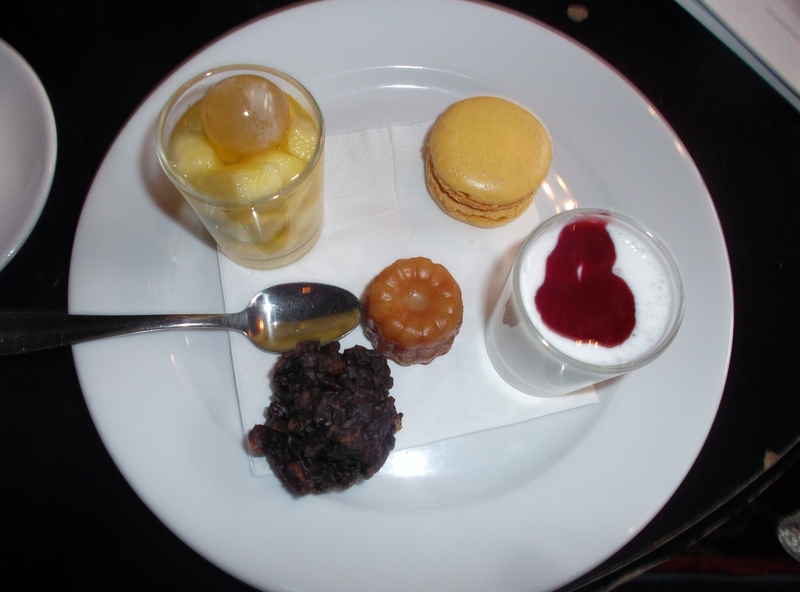 Therefore, I have NO guilt about(and nothing to show for) any of the fabulous foods that I relished in Paris!!! In Paris, a café and a plate of patisseries are sure to provide a mid-morning boost! 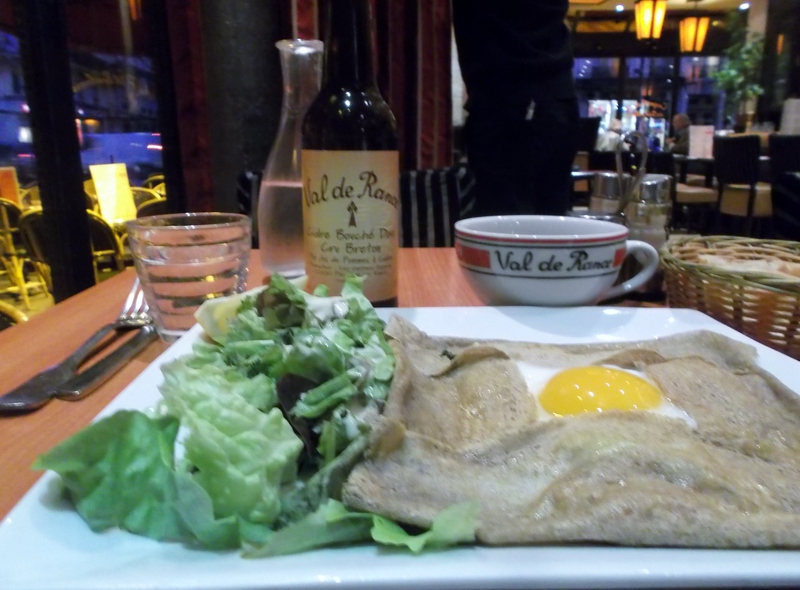 This Crepe Bretonne is actually a galette, made from buckwheat flour. It contains spinach, fresh cream, and the soft egg on top. Delicious! 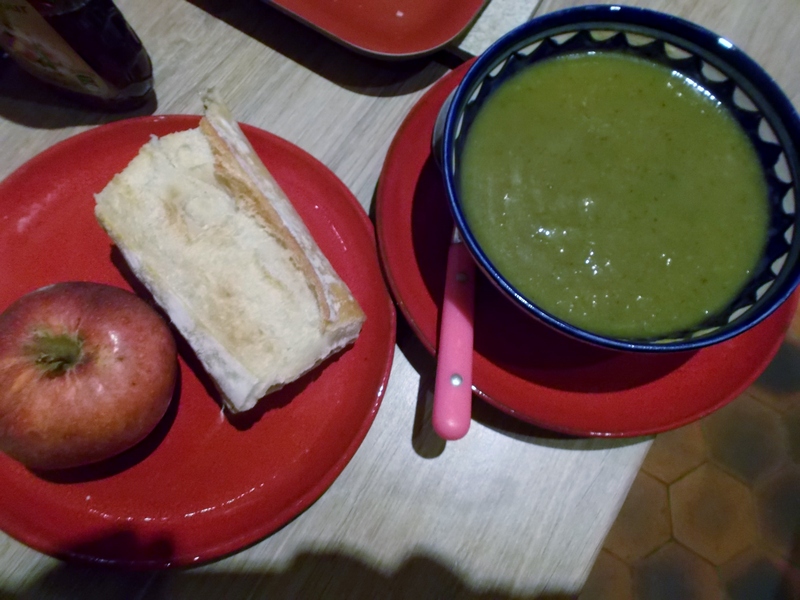 Mild apple cider (2 %) complemented the meal perfectly. 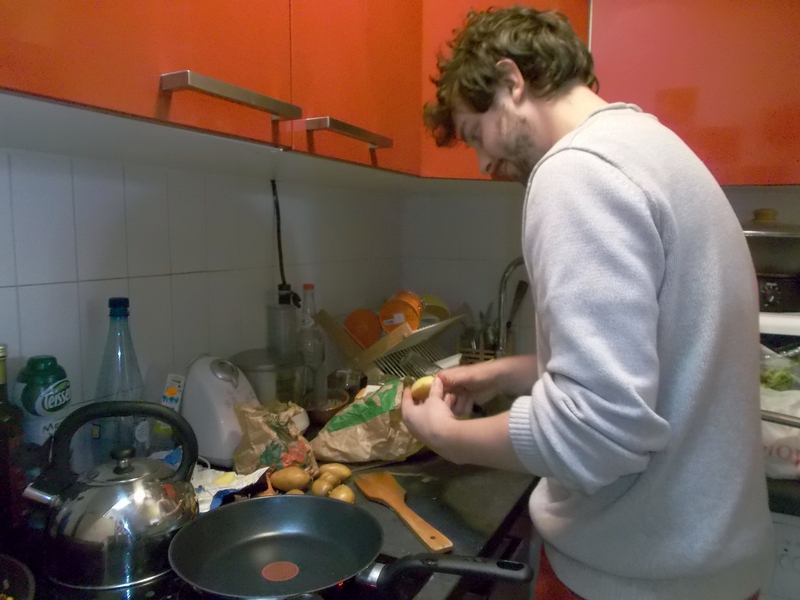 Groom-to-be, ‘Chef’ Gildas prepared a tasty omelette for Carole and me. It fortified me for the three-hour mystery tour that followed our ‘dejeuner’ (lunch). More on that adventure in a post-to-come. 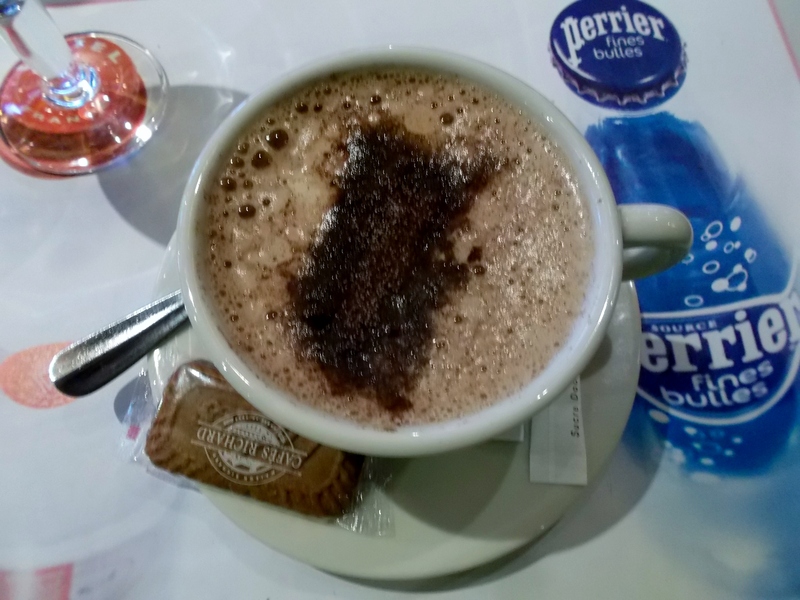 This was the first of an unknown quantity of cafes au lait that I enjoyed during my visit to Paris! This entry was posted in Canadian Expatriates Blogs, Chemical Sensitivities Blogs, Chronic Fatigue Syndrome (CFS) Blogs, Environmental Illness Blogs, Gwen Whitford Dominica, Gwenith M. Whitford, Multiple Chemical Sensitivities Blogs and tagged Canadian Expatriates in Paris France January 2015, Canadian in Paris France January 2015, Canadian Tourist in Paris France January 2015, Dining Paris France, French Beverages, French Cuisine, French Foods, Gastronomie France, Paris Travel Diary January 2015, Paris Travel Journal January 2015. What are you having for supper tonight? 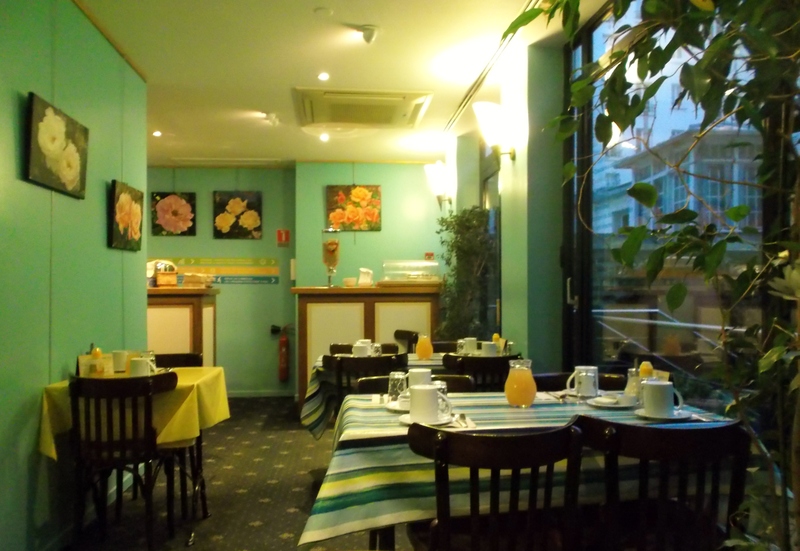 After reading this post, you might wish to dine in Paris sometime! Yum!! You know how to get to me!!! Now I want to bake! What a wonderful post, Gwen. Thanks you! Thanks Sue! I have some sweet memories of your yummy baked goods. Enjoy!